Above Seal Cove, the Bluff Trail is a moderately easy and romantic trail. Stroll along this path with your honey just before sunset and take in gorgeous panoramic coastal views. Below you is Fitzgerald Marine Reserve, a Marine Protected Area that is home to hermit crabs, sea urchins, anemones, red octopus, harbor seals and much more. Nearby is the historic and haunted 😉 Moss Beach Distillery where the two of you can snuggle up by their outdoor fire pits after your sweet stroll. 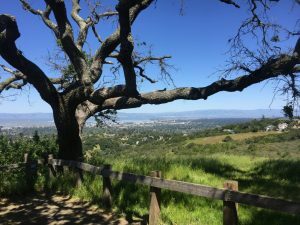 On the western edge of Edgewood Park and Natural Preserve is Ridgeview Trail which ends with a 0.1-mile climb up to “Inspiration Heights”. Here, one is rewarded with stunning vista views of San Francisco Bay and Mount Diablo to the east and the Santa Cruz Mountains to the west. Thanks to a wet winter, wildflowers are starting to bloom, so you and your date will be rewarded with splashes of color which will develop into fields of wildflowers later this spring. 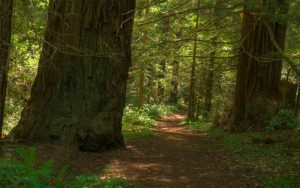 Sam McDonald Park is a gorgeous and magical forest featuring old growth redwoods. You and your date will feel like the only two people in the world when you visit the Heritage Grove, surrounded by majestic trees that are shrouded in fog. Sit in silence and take in all the sounds of the forest and keep your eye open for the bright yellow banana slug which calls the Santa Cruz Mountains home. No need to kiss the banana slug when you have your date by your side! 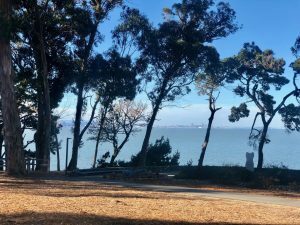 The Bluff trail at Coyote Point offers stunning views of San Francisco Bay, the City of San Francisco and the East Bay. Hike up to the Merchant Marine Memorial overlook and stop and sit with your sweetie to watch the planes land at San Francisco International Airport. Windy days offer sightings of kite-boarders and wind surfers playing in the Bay. Keep your ears and eyes open for peregrine falcons and other local birds. As the sun sets, the colors dancing off the bay are glorious. Devil’s Slide offers breathtaking views of the Pacific Ocean as well as steep cliffs which are sure to fascinate your inner geologist! This beautiful, dog-friendly trail is perfect for whale watching, bird watching and catching a sunset with your favorite pooch. 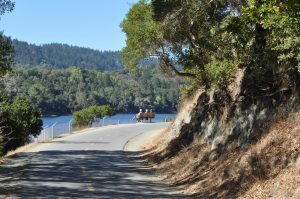 San Mateo County is blessed with a rich variety of parks, scenery and terrain. We hope you find this article helpful in your quest to discover new places to share with your special someone! Please note that some parks, like Coyote Point, charge $6 for parking. Also keep in mind that dogs are only allowed in certain parks and on certain trails. 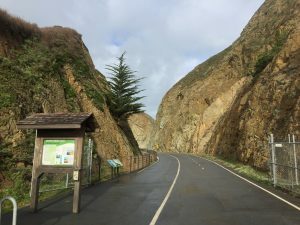 For example, Devil’s Slide, the Coastal Trail at Fitzgerald Marine Reserve and the Bay Trail at Coyote Point do allow dogs on leash. San Mateo County Parks Foundation is a non-profit organization dedicated to inspiring people to care for, learn about, and enjoy our parks. 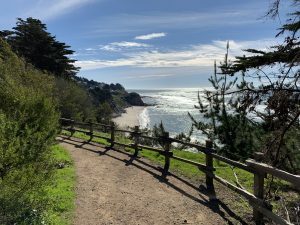 Coyote Point, date ideas, Devils Slide, Edgewood Park, Fitzgerald Marine Reserve, parks, sam mcdonald park, san mateo county, San Mateo County Parks, san mateo county parks foundation, Sawyer Camp Trail, trails. Bookmark.